Jerry Jones says that players will be cut if they don’t stand at “respect” for the national anthem—and his team’s two most prominent players have bought in. If the Dallas Cowboys are truly “America’s team,” it’s a chilling indication of the state of this country. 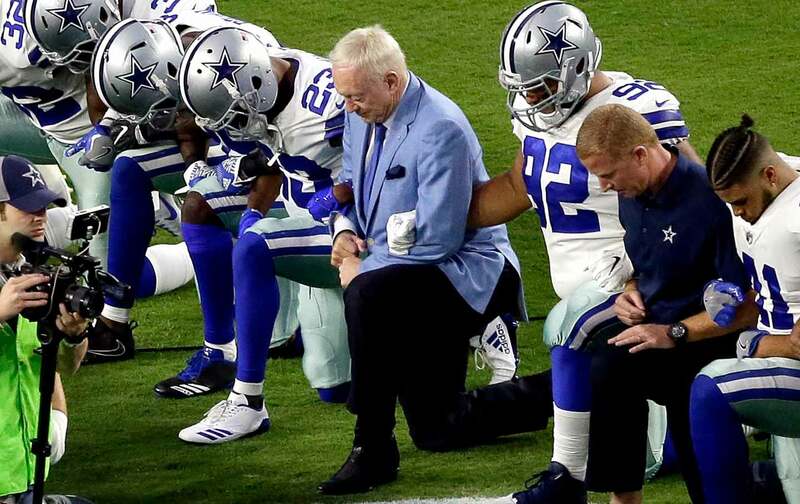 Team owner Jerry Jones and his mediocrity of a son Stephen recently stated without equivocation that anyone who does not stand in a position of “respect” for the national anthem before games will be denied employment and cut from the team. Donald Trump was thrilled with their brutish edict, but the league less so. This is because the Joneses chose to spew their alt-right marching orders at a moment when the NFL and NFL Players Association were engaging in tense negotiations to try to come together for a comprehensive policy for players who protest that respects their basic constitutional and collective-bargaining rights. The Joneses also made these comments days after New York Giants co-owner Steve Tisch went public and said that players on his team would not be penalized if they chose to take a knee, raise a fist, or otherwise use the anthem space to protest police violence or racial inequity. Us as a team, we chose to stand together for the national anthem. It was our decision. I think it just shows our culture. It shows that we have unity. We’re going to stand as one. That’s not knocking anyone else who may choose to kneel during the national anthem. But we’re the Dallas Football Cowboys, America’s Team. We stand for the national anthem. Notice the words unsaid in the statements of both Prescott and Elliott: words like “racism,” “police brutality,” “injustice.” By making this issue solely about “protesting during the anthem,” they are doing Trump’s job for him. It’s a racist disinformation campaign, and they are now party to spreading its poison. There are those who defend Prescott and Elliot by pointing to their youth, their vulnerability as young players on their first contract, and the lack of job security in the NFL. But there are people a great deal more vulnerable and a hell of a lot younger than the two football stars who are risking their lives in the streets to fight police killings. There are also players who have put their own livelihoods at risk, faced death threats, or even, in the case of Colin Kaepernick and Eric Reid, sacrificed their jobs to make these issues plain. For Prescott and Elliot—particularly Prescott—to side so resolutely with Jones is to throw these players and their union under the bus. I think it’s unfortunate that you have owners like him that use his position to intimidate and intentionally thwart even the idea of his players thinking individually or having a voice about issues that affect their communities daily, which is unfortunate. But for them, hopefully you’ll have guys challenge that and they’ll have my full support.… The longer Jerry Jones wants to say stupid stuff…about how he wants to bully his players, great, you’ll bring cameras to me and I’ll talk about how police brutality needs to end, how we need to end mass incarceration, and how we need to have better school systems. That is right. The hope is that Prescott and Elliott will at least acknowledge that it isn’t “unity” that causes the entire team to toe the Jerry Jones line: It’s bullying and fear. If that’s what makes up the spine of “America’s team,” it will be a long season in Dallas—and it is a hell of a reflection of America.